At the Dean Del Mastro trial someone is almost certainly lying. And those lies are real doozers. Del Mastro took the stand again today in his defence against charges that he and his former electoral agent, Richard McCarthy, overspent on Del Mastro’s 2008 campaign. Central to the Crown’s evidence is a $21,000 personal cheque: Del Mastro says it was intended for a software package not used during the writ period; the Crown says it paid for some election expenses, putting Del Mastro over both his personal and his campaign limit. During his testimony Del Mastro categorically denied much of the alleged email correspondence with former pollster Frank Hall that has been entered as evidence in the case. The subject at the beginning of the email chain was “ASAP”, and was changed in the chain to “Re: quote”. Del Mastro said that ‘someone’ had deliberately amended the subject line. The exchange is critical because Del Mastro has claimed that only $1,575 was paid to Hall’s now defunct polling firm Holinshed for get-out-vote calling on election day in 2008. Frank Hall has testified that Del Mastro bought a larger voter ID package from Holinshed during the writ period, which ran from September 7 to October 14 2008, and that he did a significant amount of work on the actual day as well. Ayotte also presented emails allegedly indicating that Del Mastro was in communication with Hall during election day, asking Hall how many calls he had made. Del Mastro denied that he participated in the correspondence. “I never approved that text,” said Del Mastro. Del Mastro argued that his campaign’s voter ID was based exclusively on the Conservative Information Management System, or CIMS, which was run by the Conservative Party. Any data transfer would have been minimal, and from Del Mastro to Holinshed, not the other way around. Ayotte then showed Del Mastro some polling results allegedly conducted by Holinshed on his behalf. Del Mastro picked the results apart, suggesting that the findings, which showed wild fluctuations in support, were not to be believed and would have been useless to him. “Did you ever receive tables of data as set out in this email during the campaign?” asked Ayotte. Earlier in his testimony Del Mastro indicated that he often went into overdraft on his bank account, thus putting a hole in the Crown’s argument that his cheque for $21,000 must have been backdated in December, as Hall testified, given that Del Mastro did not have the funds in his account in June, when the cheque was dated. As per the $21,000, Del Mastro said that it was for Holinshed’s GeoVote software, which he says he never received. “You are just out that money?” Ayotte asked. “That’s correct,” said Del Mastro. Within the $21,000 Del Mastro testified that two thirds, or $14,000, would have been allocated to the Peterborough Electoral District Association (EDA), with the remaining $7,000 to Del Mastro’s constituency office, and paid for by the House of Commons. Del Mastro also testified that he would have been more than willing to provide his own email records, but the House of Commons enterprise server purges email after two years. After the lunch break the Crown got its chance to examine Del Mastro. Chief Prosecutor Tom Lemon tore into the Peterborough MP with regard to the $21,000 cheque, but Del Mastro kept his cool. “Does that sound like a sound business practice?” asked Lemon to the fact that Del Mastro claims he wrote the cheque as a deposit on some software that he had never seen in action, and ultimately never received. Del Mastro’s response was to say that it was a matter of trust, and that trust was central to business practice. He said that the arrangement was a “verbal understanding”, which explained why the contract was signed later – and not because he was trying to place spending outside of the writ period, as the Crown alleges. Del Mastro kept his cool as Lemon became increasingly frustrated. At one point Lemon’s anger resulted in both defence counsel Ayotte and Justice Cameron speaking out to calm him. Lemon, it appears, had made the mistake of using business practices in the auto industry as an analogy. 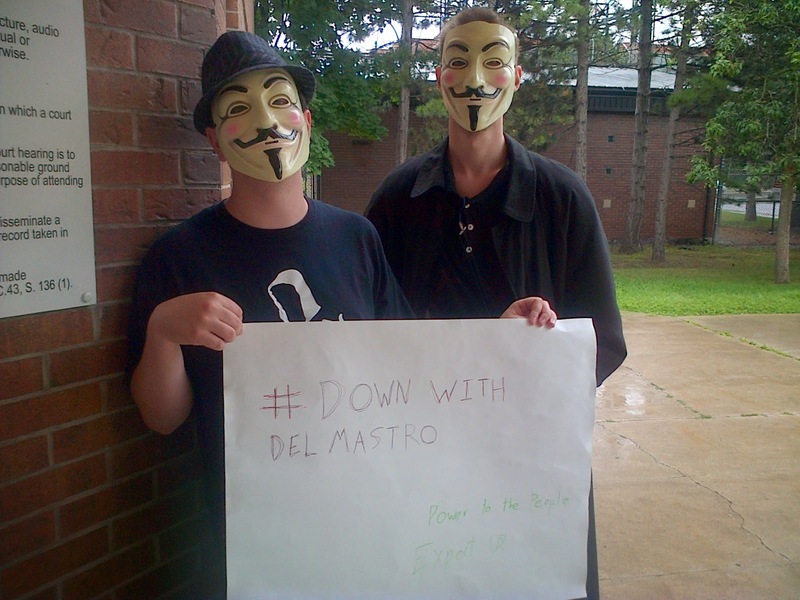 At the end of the day Del Mastro comported himself well. He kept his cool. He had an answer for everything. Perhaps the Crown would do well not to reference the car sales business. Del Mastro is an expert at that. He’s not so bad at politics, either. And as he himself might admit: there isn’t much difference between the two. June 26: Was Frank Hall Dean Del Mastro’s patsy?